Ulrich Nielsen at Hyde Yachts asks me to report a €1 million price reduction on the 35.8m expedition yacht Navigator. Originally built in Denmark in 1941 as a cable laying ship, she was completely rebuilt in 2011 to offer all the comforts of a superyacht, sleeping 12 guests in a master suite, two double and three twin cabins. A single 280hp Alpha diesel engine gives her a range of 2,400 nautical miles. 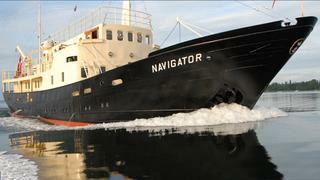 Lying in Copenhagen, Navigator is now asking €3.5 million.